Framed kids art brings a number of interesting custom framing concepts into the spotlight. First, by framing children’s art, a simple piece of art is transformed into an acceptable form of wall décor. From both the artist and the custom picture framer’s point-of-view, the young artist has produced something very special – framed children’s wall art that will be the focus of the family for many years. Why is Framed Kids Art So Refreshing? 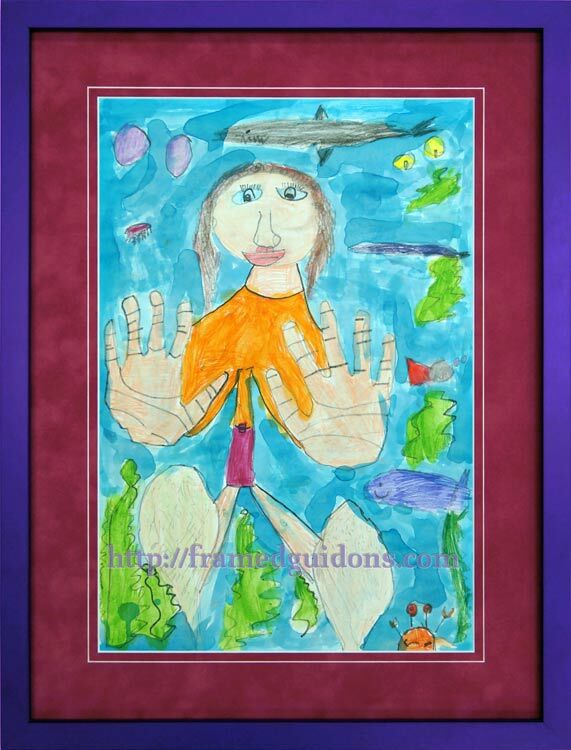 Framed kids art is refreshing because a young artist is creative in their approach to drawing, painting, and sketching. A child artist creates art without regard to an adult’s preconceptions about what constitutes “good art”. Basically, kids art reflects the characteristics of life that make them happy. The creative pieces that represent children’s artwork also provide us with a perspective on life as seen through a child’s eyes. What we see is their unbiased imagination about life at work. Because in child’s art, we see the pure innocence of the world. Art ideas for kids come from the world that surrounds them. They focus on trees, people, plants, dogs, cats, fish, clouds, flowers, and the sea as the primary sources of inspiration for their art. This brings up the second aspect of why parents are eager to transform their children’s art into framed artwork. The second interesting aspect of framing children’s artwork involves the deep pride a parent has when they share the joy of the completed art piece with their young artist. Although their child has not mastered all of the fine techniques of color, shape, brushstroke, etc. their vision of the world (fish, birds, people, sky, animals, etc.) is committed to paper or canvas. They are displaying an unpolished form of talent. This talent frequently provides an interesting psychological benefit. The benefit provided by the child artist is inspiration and encouragement for their parents and siblings. As many of our customers and website visitors know, we operate two websites for our custom picture framing business. Cindy’s Custom Framing & Antique Art is an e-commerce store that sells original pieces of antique art. The store also sells local art, oil paintings, and reproduction prints. 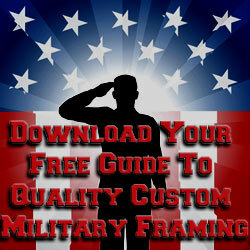 That website presents examples of civilian-related and military framed art examples and services. There is even a section on that website devoted to children’s art. In contrast, this website (Framed Guidons) is primarily focused on our custom military framing services, guidon sales, military shadow boxes, flag framing and guidon framing, military awards and certificates, and examples of completed military picture framing. 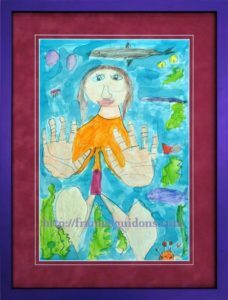 Why Include Framed Kids Art on A Military Framing Site? Initially, it almost seems counterintuitive to include children’s art or kids framed art on a site devoted to military framing and military customers. However in some cases, it is totally appropriate as explained below. First, we never pass up an opportunity to acknowledge or show respect for active duty service personnel, veterans, retired military personnel, and active-duty military families. For this reason, we are honoring a retired military father and his wife by displaying their child’s art. The piece featured in this blog is an award-winning piece of artwork by their young daughter. 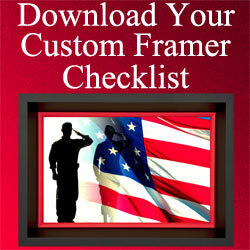 As we have indicated numerous times throughout this website, it is our pleasure to frame for military customers. This is especially true when a retired military customer and his wife bring in their young daughter. In this case, it was for a session that involved designing a custom frame for the young artist’s colorful work. There is a huge psychological benefit for the young artist when their parents frame their artwork. Spending a little money on a custom frame project is a way of showing support and appreciation to a young artist. It also elevates the young artist’s confidence. This, in turn, enables them to grow artistically. It also shows the young artist that they are worthy of praise and that their parents are extremely proud to openly display their framed artwork. This provides encouragement which is a huge boost for the child artist’s ego. When parents bring kids art into our shop for framing, we suggest that they include the child artist in the design process. In essence, we make the young artist our customer during the design process. This makes the child feel really important. We involve young artists in the custom framing process of their work. We focus on their likes and dislikes. We make their opinions an important part of the design process. This includes the color selection of both mats and frames. In some cases, we make special mat cuts to accommodate a unique shape of the art. By including a child in the decision-making process for framing their art, parents are providing the child with a very special day in their life. The framed child’s art will be hung in the home and enjoyed for many years. Seeing the framed artwork reinforces the child’s importance to their parents. This, in turn, provides the child with memories that will last for many years. Think about the end result: the child grows up, matures, and marries. Then, they have children and include their child in the art framing process. These are memories that are very special. These special memories provide a bonding experience that will be remembered for generations. Framed children’s wall art is special. It is our experience that framed kids art provides the young artist and their parents with positive stimulation—and framed art will be seen for many years. When you think of framed kids art, think of the beauty you child has produced. We invite you to bring your child into our shop with their artwork. We will create a special memory for both you and your child.